CondoInvestment.com allows everyone to create a personal recently sold search to research recently SOLD real estate and also offer a quick condo search for recently SOLD Gulf Shores and Orange Beach condos with closed prices and closed dates for every condominium and subdivision in Baldwin County; each one of our sales pages for condos and subdivisions has the option atop the page to view the recently SOLD listings. We currently offer Baldwin County SOLD info with Bay County (Panama City Beach, FL) and Okaloosa County (Fort Walton & Destin, FL) coming in the Spring of 2018. To help investors, we provide revenue information for all beach houses and condos in Baldwin County and Perdido Key Florida and we're working on revenue info for properties in Panama City Beach, FL in Bay County and Destin and Fort Walton Beach in Okaloosa County. Our network is full of real estate information and helps our clients with boosting rental revenue. One, we use targeted vacation traffic to help our condo owners improve their annual revenues. Our coastal network spans from Mobile, AL to Panama City, FL and consists of approximately 70 condo websites, community and subdivision websites and hundreds of social media pages that generates tens-of-thousands of daily views. Approximately half is real estate sales and half is vacationers researching for an upcoming trip. This targeted traffic has had a profound impact on our client's annual revenues and helped with cash flow. Diversity in marketing has become increasingly important as traditional websites, like VRBO, now lists almost every unit in a building and watered down the exposure. Secondly, we're a traditional real estate group with 15+ years of experience selling homes, commercial real estate, condos and land, and in a Google sales search, CondoInvestment.com organically ranks #1 for almost all condos and many subdivisions; this ensures our listings and "featured properties" get unmatched exposure. We're also very proactive and share our featured properties with a growing audience of over 50,000 on Facebook alone; almost all of these followers have visited the beach since 2013. (Most condos and large subdivisions have their own Facebook page. They're tied in to this website and our CondoInvestment.com Facebook page) Through social media, we frequently connect with current owners - which can be helpful - especially in buildings where units for sale don't surface very often. Basically, we can often find condos for sale when needed. Read more about today's buyers and how we market condos and homes for sale along the Gulf Coast and like one-or-more of our Facebook condo pages to receive periodic info for that particular condo including sales, new listings and news for area attractions and upcoming events. As far as information, we've combined current listings and their histories with recently sold details including the closed date and actual sold price. We've included rental revenue information for properties where this is important - like condominiums and beach houses. Aerial photography has been used for the beaches to help with perspective and for homes when beneficial. We've made it as easy as we could to research our area. Easily find sales info for every subdivision and condominium along the Gulf Coast - from Mobile and Baldwin County Alabama to Pensacola through Panama City Florida. Revenue numbers and recent sales prices helps condo investors and home buyers to determine value and ownership costs while our map search, labeled aerial imagery and numerous pre-defined searches helps get the most from your time on CondoInvestment.com. BUYERS / INVESTORS: We help our buyers to maximize their rental income by promoting their properties on our network. We tested multiple units in the Lighthouse condominium and increased revenue by 10% over identical units not on our network. If you're planning to rent your property, please take a minute to read about our supplemental efforts. ; we explain how and why this works. This is free to our clients and our way of showing appreciation. SELLERS: Our website ranks #1 on Google for most subdivisions and almost all condos in the area. When potential buyers search for [Property Name] for sale [City], they'll typically find CondoInvestment.com atop the rankings. This translates to maximum exposure - we also prominently feature our listings atop of its subdivision / condo sales page. For example, visit our Wharf condo example. Our aerial imagery provides unprecedented access and perspectives while browsing Gulf Coast real estate. We're continuously adding videos and improving our coverage of the Gulf Coast and Eastern Shore while also adding useful local info such as our restaurant menus page; all local restaurant menus in the same spot. Quickly research all Gulf Shores condos and Orange Beach condos on the Alabama Gulf Coast and filter using: maps, aerial images, price, amenities and more. These same real estate sales filters make browsing our Florida Gulf Coast condos: Perdido Key condos and Pensacola Beach condos, along with Destin condos, just as easy. Our pages offer continuously updated MLS Listings with comprehensive property details including RECENT SOLD INFO and REVENUE INFO and for those investment-minded buyers, a CASH FLOW example is available. Also included is Interactive Google Maps, aerial videos and imagery, amenity info and much more. Find any real estate for sale from Mobile, AL and the Eastern Shore, Gulf Shores & Orange Beach Alabama. Also find helpful condo information for Northwest Florida on CondoInvestment.com. Want to search by subdivision? Try the Gulf Shores subdivisions, Foley subdivisions or the Orange Beach subdivisions search to find homes in South Baldwin County. Fairhope subdivisions, Daphne subdivisions and Spanish Fort subdivisions also offer multiple search options for homes on the Eastern Shore, such as: MAP SEARCH, SEARCH BY PRICE, SCHOOL-ZONE, WATERFRONT and many more options in our Personalized Search. Subscribe on YouTube.com/CondoInvestment for weekly aerial videos of the Gulf Coast. We use this traffic to help our clients and friends. How? Five years ago, every condo in a building was not on VRBO - or similar website. Now, even the local agencies use VRBO. Every condo in a building, is likely already on VRBO. This not only dilutes rental traffic, but puts condo owners in competition with other owners using the same online portal. We use our network to direct thousands of vacationers - every day of the year - to our client's condos using CondoInvestment.com, our Facebook condo pages and our condominium-specific websites. This only takes a little extra work on our part and it's our way of saying thanks to our clients. The Gulf Coast is one of the more popular beaches in the US and Gulf Shores was recently named a top 3 rising star destination. In the Summer months, most condos stay booked, but especially in the off-season when fewer people are visiting the beaches, our supplemental network will help to increase traffic and improve revenue. We laid the ground work for this network circa 2013 and have been growing the audience since. As of Spring 2017, the network has been converted to Wordpress to improve the compatibility with today's vast array of tablets, laptops and devices and the base audience sits around 50,000 followers. We share interesting and helpful info using Facebook to help both: vacationers looking for entertainment options or those shopping for a vacation condo. Client condo listings are prominently displayed atop our pages to ensure maximum visibility. We rank #1 in Google's organic search for almost every condo on the Alabama Gulf Coast and many subdivisions too. Owners can't use FOR SALE signs, so we help to sell condos using a variety of websites, Facebook pages and use aerial imagery to tie everything together. Put yourself in a buyer's shoes and Google your condo for sale and city to see. Example: For the Lighthouse condos in Gulf Shores, Google - "Lighthouse condos for sale Gulf Shores AL" and you'll find that CondoInvestment.com ranks #1 and our condo site ranks top 3 and our Lighthouse Facebook page also ranks well enough to generate traffic; both rental and sales traffic. Homes are done the same and shared with a large network of websites and social media pages. Although our domain name has the word "condo", we are a full-service real estate group and can help with residential and commercial. Read more on why Google search results relate to traffic and why it's so important in selling your home. ***GREAT NEW FEATURE: Like us @gulfcondos for aerial images, videos and general area info. Interested in a specific condominium? Like the individual Facebook Condo Pages to see NEW LISTINGS in your Timeline as soon as they hit the market. SOLD Prices - See what the markets been like. Our area, comprised of Baldwin County and Escambia County, the Gulf Coast, is known all over the world for its miles of pristine white-sand beaches, laid back atmosphere, and spectacular fishing opportunities. The fluffy white sands are made of weathered down quartz crystal that washed down into the Gulf from the Appalachian Mountains and are soft and warm to the touch. The warm waters of the Gulf of Mexico are perfect for swimming and year-round fishing. When the weather is too cold for swimming in the Gulf of Mexico, try Gulf Shores condos for sale with swimming pools or Orange Beach condos with swimming pools. It’s no wonder that thousands and thousands of people flock to the Gulf Coast every year, either for a quick vacation in a Gulf Shores beach front condo or to buy real estate they can enjoy for a lifetime. 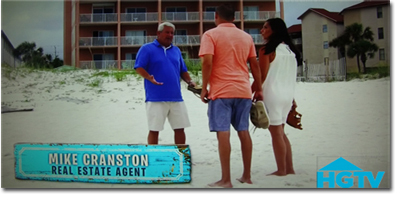 We make browsing for properties from Destin, Florida to Gulf Shores, Alabama is a click away. We've been on these same beaches since 2001. CNN recently named Gulf Shores' beaches the best "Can't miss" beach in the US. If you have a question, email us or call 251-273-2776 for immediate assistance. The Alabama and Northwest Florida Gulf Coast is a large, thriving coastal area and we know it as well as any one! This graph shows the significant growth of the Gulf Coast's beaches from Gulf Shores Alabama to Destin Florida. This growth is synonymous with gulf front condo development. This development happens through pre-construction condo sales. These investors lock in the prices, reserving the rights to buy the completed condominium. Construction can take 2 years and their not making anymore beaches. Current & upcoming condo developemnts with FAQ's. The Gulf Coast is a huge area that spans the perimeter of the Gulf of Mexico and contains mostly Florida communities that span from Perdido Key & Pensacola Beach, FL all the way to Miami Florida. Our areas, or Perdido Key and Pensacola are near our South Alabama coast. On the South Alabama Gulf Coast, Orange Beach and Gulf Shores comprice Alabama's Gulf Coast. Check out our Orange Beach Aerial real estate images. It’s no secret that the Gulf Coast is one of the most beautiful areas in the United States, but the pristine crystal-white beaches at Gulf Shores really go above and beyond visitor’s expectations. The distinctive snow-white color of the sands at Gulf Shores is all thanks to eroded quarts that washed down from the Appalachian Mountains over a prolonged period of time. The minerals were so worn down that, instead of being grainy like sand at other beaches, the sands at Gulf Shores are soft, fluffy, and warm. An amazing two-mile stretch of beach is available for swimming and public use and a number of Gulf-front condominiums also offer smaller private stretches of beach for resident’s and guest’s staying there to use. Aside from the gulf front condos, many Gulf Shores condos with beach access offer owners and guests convenience at more affordable costs, but still offer great amenities and views. Orange Beach is the same and has numerous opportunities for buyers interested in Orange Beach condos with beach access. Also, much of Orange Beach sits on different inland waterways, bays, coves and canals, so Orange Beach condos with boat slips is a common search for real estate on the water. The Gulf of Mexico is known for being an amazing fishing spot, so you’ll see a number of fishermen and women lining the shores or heading out on boats for some inshore or offshore fishing. As amazing as these beaches are, the city of Gulf Shores has big plans to revitalize the area by revamping the image and amenities of the area. The Gulf Place Revitalization Project began its first phase this year, the ultimate goal being to completely renovate the popular area of Gulf Place on the Gulf Shores public beach. New parking lots, community green areas, restroom facilities, an expansive beach-side boardwalk, and extensive landscaping are intended to make the area more pedestrian-friendly and improve the area for visitors and residents. In doing so, the city hopes to boost the economy in the area, which largely relies on tourism for revenue. Popular spots on the beach like the Gulf Shores Hangout can expect to benefit by the increase in visitors that the Gulf Place Revitalization Project hopes to attain with these renovations. Gulf Shores is also known for being home to a beautiful state park and a wildlife refuge. The Gulf State Park is a very popular destination for both tourists and residents alike. With a fishing lake, campgrounds, a massive pier, and breathtaking scenery, it’s no wonder that the area is so popular. Sitting right on the beach, this is the perfect place to go camping when you want to fall asleep to the sounds of natural wildlife and waves crashing against the shore. The pier at Gulf State Park claims the title of the biggest on the Gulf Coast. Coming in at a whopping 1,540 feet long and with 41,800 square feet of space, this is one of the most popular places to go fishing in Gulf Shores. The several species of fish found this close to shore offer a fun challenge to fishermen and women of all ages and experience levels. The Gulf State Park pier is also where fireworks are set off from for celebrations throughout the year. Bon Secour National Wildlife Rescue is located just under fifteen minutes from the beach, but it is the place to go if you hope to spot sea turtles or the endangered Alabama beach mouse. Gulf Shores and Gulf State Park offer over seven miles of backcountry trails, making this area a nature lover’s dream. Gulf Shores is very close to other major coastal towns such as Orange Beach, Perdido Key, and Pensacola Beach, making it a great place to stay if you intend to hit up several other coastal towns while you’re here. The world-famous Flora-Bama Lounge in Perdido Key, Florida is less than twenty minutes away. Both Flora-Bama and the Gulf Shores Hangout are very popular in the area, providing fresh seafood, live music, and a number of other events. Flora-Bama hosts several annual events that attract thousands of visitors each year, first and foremost being the Tri-State Mullet Toss. Given its close proximity to Perdido Key, Gulf Shores is a great choice for those hoping to stay at one of the numerous beach-side condominiums during one of Flora-Bama’s events. Gulf Shores, Alabama is a growing community that is gathering more and more attention for its pristine beaches and numerous family-friendly activities in the area. In fact, just last year CNN reported that Gulf Shores was one of the most beautiful beaches in the United States. If it is beautiful now, imagine what it will be like in a few years when the Gulf Place Revitalization Project is fully completed. There are many big and exciting changes happening in Gulf Shores that will seal its place as one of the country’s best southern beach towns. The Eastern Shore is comprised of the coastal area stretching along Mobile Bay and spans from Spanish Fort to Fairhope with Daphne, Alabama in the middle. These three areas are similar and Fairhope is consistently voted as one of the best places to live in the United States. We've also included numerous pages to display types of real estate, such as: commercial, condos, residential, land and various other search filters to easily separate real estate for sale on the Eastern Shores of Mobile Bay. Central Baldwin County is comprised of numerous small towns like Robertsdale, AL or the "Hub City" which is called this because it literally lies in the middle of Baldwin County, like a hubcap. 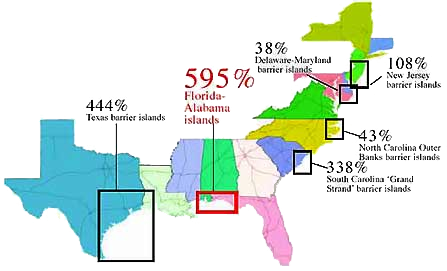 Foley, AL is probably the largest city considered to be central Baldwin County and has grown faster, or as fast as any area in Baldwin County; Alabama's fastest growing county. Foley has added a lot of small businesses, but has also grown commercially. Foley commercial real estate is booming with several current developments under construction, like the OWA development that many may remember as the Blue Collar Comedy site that was SOLD to the Poarch Creek Band of Indians and is now slated to become a Six Flags-type of entertainment venue. Foley also will be the home of a new Auburn satellite campus which is on the border of South Foley and North Gulf Shores. This Auburn campus is yet another example of the growth of Baldwin County. Other areas in central Baldwin County are: Silverhill, Loxley and Elsanor. These areas all sit in the middle of Baldwin County with areas North, like Bay Minette. To the East of Robertsdale approaching the Florida border is Seminole and South to Elberta which is just East of Foley, AL and has waterways that meander in to Gulf Shores and Orange Beach, AL. CondoInvestment.com is a full-service real estate team offering investment help for our condo owners using this and other websites in our real estate network. For real estate info, try visiting our pages that display comprehensive real estate info, like: Gulf Shores real estate and Orange Beach real estate representing the Alabama beach area or Fairhope real estate, Daphne real estate and Spanish Fort real estate representing the Eastern Shore real estate of Mobile Bay in Baldwin County. Perdido Key real estate and Pensacola real estate offers comprehensive info for the Florida Gulf Coast. One of our most popular features is the aerial imagery we incorporate to help users identify condos and homes for sale and better understand the surrounding area. The videos and images show sections of the beaches with condos labeled. We've included menus for every restaurant at the beach; find the perfect spot for dinner before leaving home. Find aerial video of the waterfront restaurants and condo info for convenience.